Yesterday I was delirious, lost in Stone Crab and Mustard Sauce heaven. I spent many years of my young adulthood in Miami. 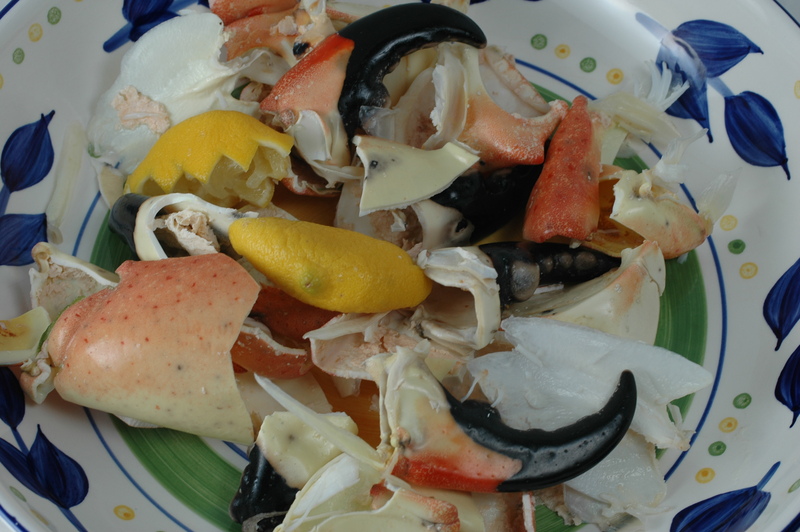 Stone Crabs were a main part of my diet when in season. Joe’s Stone Crabs on South Beach was an institution even when the neighborhood was not so nice. We ate there often. Every chance I could, I bought them. I made mustard sauce, cut lemons, cracked the claws and man, I was in heaven. You Floridians know what I mean! Yesterday when I was in Clean Catch Fish Market, Bill told me they were getting in some big claws in the morning so, how could I resist? I reserved 6 claws. After I saw the size, I cut my order in half. Each claw was nearly a pound or more! Since he advised me to come after 11. I sauntered in at about 12:30 and sure enough the claws were in. They were easily a pound each. Huge! 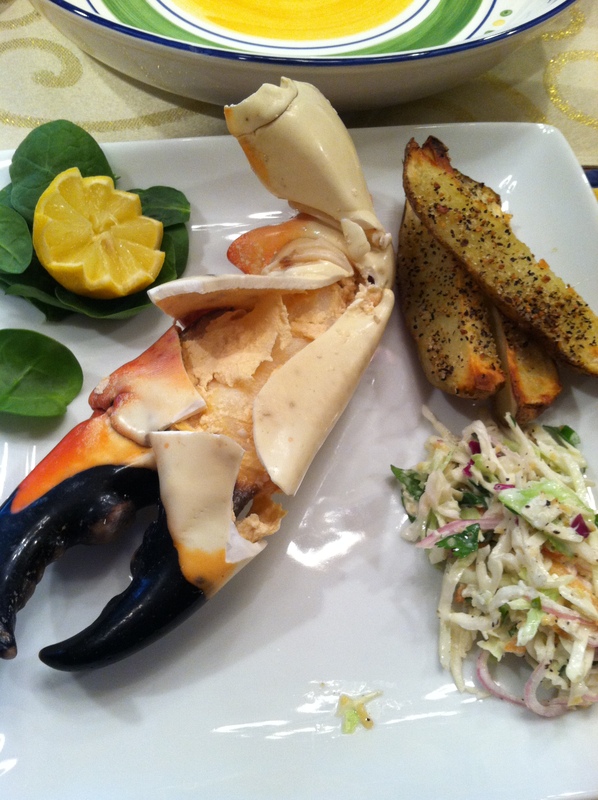 There are several things about stone crabs you should know. You always buy them cooked. All you have to do is crack them and eat. They are harvested one claw at a time. They re-grow what ever claw is taken. Some years it is all left claws others, it is all right claws. You never eat the entire crab, just one claw or the other. The crab is not killed, pissed off, I’m sure, but not killed. Besides, they can regenerate claws so I don’t feel so bad. I wonder if the claws grow fast to accommodate the size of the rest of the crab. I have never seen claws as huge as these. Wonder if they grew by the nuclear power plant in Jupiter, FL. Needless to say they were delicious! I made coleslaw, oven fried potato wedges, Mustard Sauce, cut lemons, poured well-chilled champagne. As you may know, I love to make condiments. Here’s a great sauce to add to your repertoire. Stir together to make a smooth paste. Add 2 tablespoons chopped fresh tarragon for a different flavor and versatile sauce. Mix everything together an allow the flavors to mellow for at least 30 minutes before serving. All that remained . . . Sorry Frugal, this is definitely NOT a frugal meal! We may eat beans, rice and cornbread later this week but this was a great indulgence. 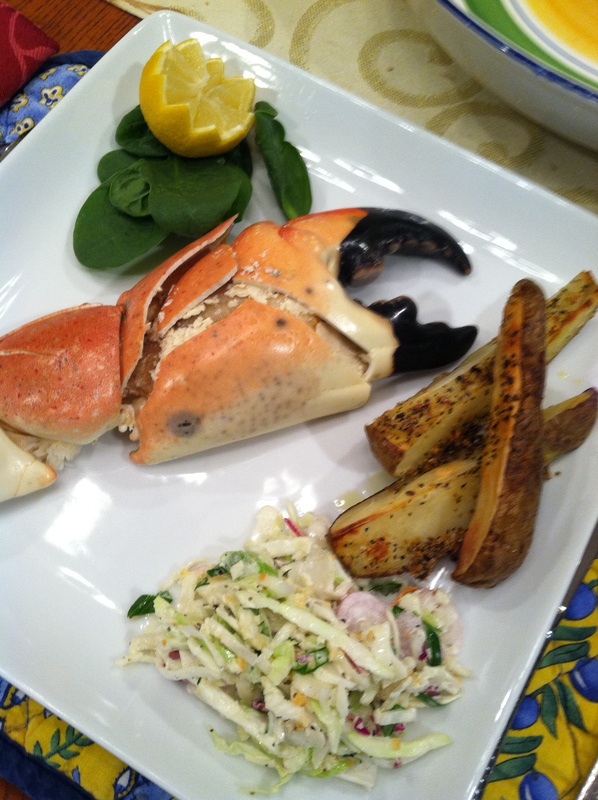 This entry was posted in Recipes and tagged Claw, food, Joe's Stone Crab, Miami, Mustard, Stone Crab. Bookmark the permalink. Yes, I am lucky and even if we did have to eat beans, rice and cornbread, it would be the best ever! 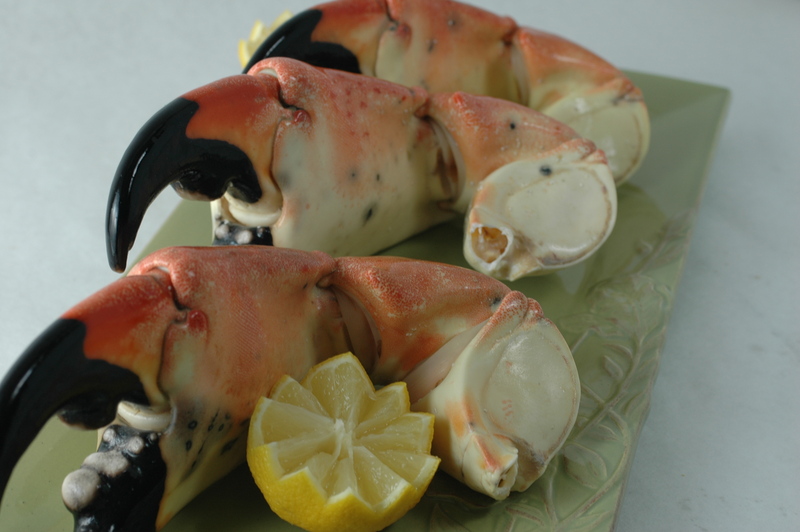 We used to live in Key Largo and also in Coral Gables and loved when it was stone crab season. We have a friend who had a license to catch them and would often get the huge ones you had. Nothing better. We were at Joe’s in October and of course we had all of their famous dishes. We really were lucky. He would always call us when he got the really bigs ones. I used to live in Coral Gables and Coconut Grove too. I love that area! Crab, glorious crab – my ABSOLUTE favourite! They look like the size and shape of the claws we get from our northern Australian mud crabs. I love crab. Can you do a stone crab in wok with sweet chili sauce? Mud crabs are fantastic that way. These are typically eaten cold. They get cooked right away after harvesting to prevent the meat sticking to the shells. They could be served warm but here, usually not. I like sweet chili sauce. Mud crabs sound like something to look into! definitely worth it if you visit northern Australia.